In the early 1900s, the territory of Hawaii issued a land grant offer for the Punchbowl Crater region. These names were published in the O Luso newspaper notifying individuals of the status of their application. The lists are divided into four sections: approved, second opinion, suspended, and rejected. I’ve extracted the Portuguese names from the lists and compiled them using the same four categories. What’s The Background Story to the Punchbowl Land Grants? 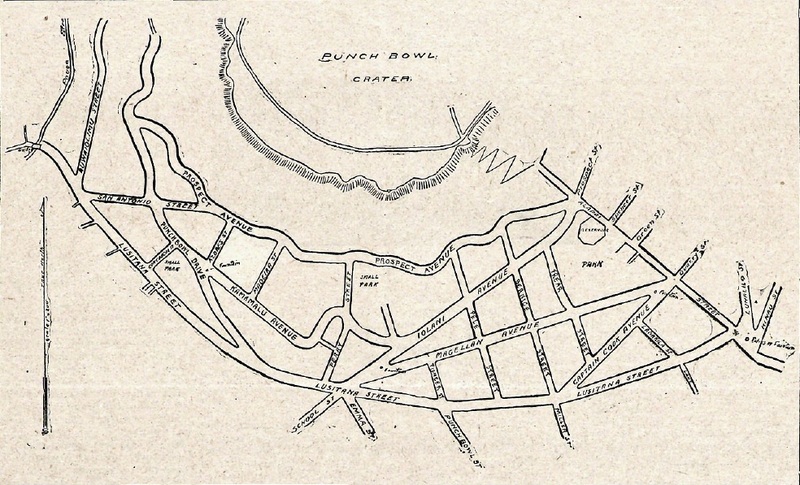 Around 1911, the territory opened up the sale of land grants in the Punchbowl crater. This would be the area seen on this map that was published in “O Luso”. Preferential treatment was given to people who had a legal rights to reside in Hawaii. Those who were citizens had the highest priority. This means that those applying for a land grant would have to prove they were born in Hawaii, that they were naturalized, or had special rights of citizenship. If you’ve ever researched people born in Hawaii prior to 1900, you know how difficult it can be to obtain this paper trail. On the 26 of May 1911, the Auwaiolimu Club was formed and their officers voted on. They would work in conjunction with the Lusitania Society as advocates for the rights of the Portuguese community where the land grands were concerned. They were the liaison between the territory officials and the community. The Lusitania Society, because it served the Portuguese community, was able to provide outreach directly to members. The Auwaiolimu Club was organized to advocate on their behalf, figure out what documentation was needed, and then to help people obtain the proper proof. A special meeting of the Auwaiolimu Club was held at the Lusitania Societyinf February of 1912. Over 200 people attended. Those whose applications were approved had special preferential rights. The second group needed a special interview so that their applications could be further considered. The third group had their applications put on hold for a second opinion. These involved people who met certain requirements, but did not have American citizenship. Their children, grandchildren, and others applied on their behalf. This list may be the most helpful as those relationships were listed. The fourth group is straightforward. All the people on this list had their applications rejected. I really don’t know. I didn’t find anything in the article that referred to them. They may refer to application numbers or land plots. Given that some people have a range of numbers by their names, I’m guessing that they are plot numbers. I will update this article if I find out more information. Do The Punchbowl Land Grant Records Still Exist?? I could not find any resources specifically mentioning the Punchbowl land grants of 1912. I searched government websites and familysearch.org. FamilySearch does have land and property records, but none for 1912. In fact, they have a gap in their records for that year. Do you know how one might obtain these records? If so, please let me know or tell us in the comments. If these records still exist, they may prove helpful to genealogists whose Portuguese ancestors lived in the Punchbowl area and where other vital records are lacking. O Luso. Honolulu, Hawaii, 24 Feb 1912. Page 2. Melody, your site is fascinating, thanks for keeping it running. I contacted you before as I am condcting a multi-site, multi-period research tha includes the Portuguese in Hawaii. If you care to know a bit more here is our site: http://colour.ics.ulisboa.pt/ In the publications links there is one article on the Portuguese in Hawaii. Cristiana, Thank you for compliments on the website! It is a passion. I will be sure to check out your article on Hawaii. Thanks for providing the link for my readers.